SANTA ROSA, Calif. -- A Chihuahua puppy that was found in a trash bin at Santa Rosa Junior College last month died Monday after surgery to repair her two broken front legs, college officials said. The puppy, named Darla by Sonoma County Animal Services employees, was taken to an animal hospital after an SRJC employee found her Oct. 27 in the receptacle at the Bech parking lot near Lark Hall. Sonoma County Animal Services then took custody of the puppy and began an investigation. Darla did not have identification tags or an electronic chip, and investigators still do not know who put her in the trash bin. 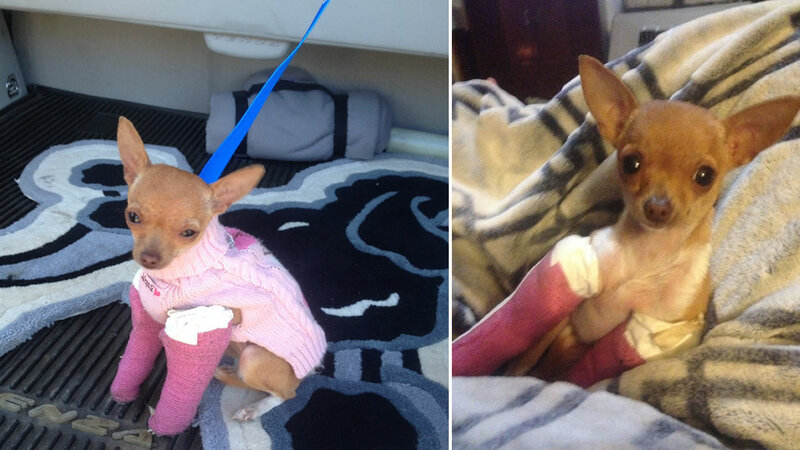 Sonoma County Animal Services officials determined Darla needed special surgery by an orthopedic surgeon. Dr. Dan Famini, SRJC's Veterinarian Technician Program coordinator and the contract veterinarian for Sonoma County Animal Services, said a specialist offered to perform the two-hour bone plating procedure, which was conducted Monday on both front legs. Darla went into cardio-respiratory arrest shortly after the surgery was completed. Vets started CPR and restored the puppy's heart and lungs, but her cortical brain function never returned, Famini said. After Darla's vital signs appeared to stabilize, she was placed under intensive care and passed away without waking up a few hours later, Famini said. "I, along with everyone who has been involved with Darla, are truly heartbroken at her outcome," Famini said in a Facebook post on Santa Rosa Junior College's account. "At the same time, I am sincerely grateful for everyone who provided Darla with these last two weeks of comfort and love."